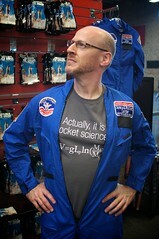 In early September, the day after Dragon*Con, I traveled with some good friends to Huntsville, Alabama to raise money for Space Camp. We put on a show called Rocketfest – it was the brainchild of singer/siren Marian Call, and we had a fantastic time. But don’t just believe me! My friend Melissa Kaercher went there too, and wrote a brief blog post about it. Melissa’s also a great photographer, and took the wonderful shot above of all of us posing under the huge full-scale Saturn V model suspended from the ceiling. You can see more of these photos on her Flickr page. I kinda like the photo inset here, too. Noble, isn’t it? I didn’t wind up buying the jump suit, but Molly Lewis got herself one. Melissa’s pictures of her – of everyone – are great. It was HUGE fun, and we raised money to help get kids to go to Space Camp, which fills me with joy. It was an amazing place to visit, and if you’re ever anywhere Hunstville, it’s well worth your time to check out.